Spray 6- to 7-quart slow cooker with cooking spray. In slow cooker, place onions, butter, salt, pepper and dried thyme. In medium bowl, mix flour, sherry and water with wire whisk until blended. Stir into onion mixture. Meanwhile, set oven control to broil. Line cookie sheet with foil. Arrange baguette slices in single layer on cookie sheet. Broil with tops 3 inches from heat 2 minutes, turning once, until lightly browned. Sprinkle cheese evenly over slices; broil 1 minute longer or until cheese is bubbly. 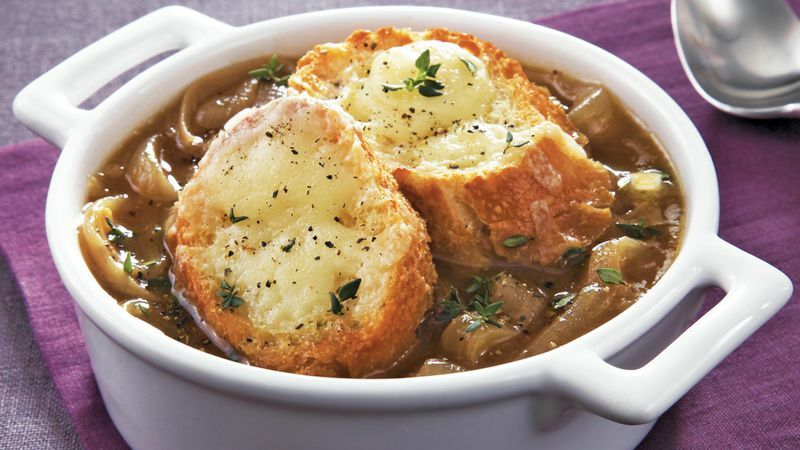 Top each bowl of soup with 2 cheese toasts. Sprinkle with fresh thyme.